MoreBeer! 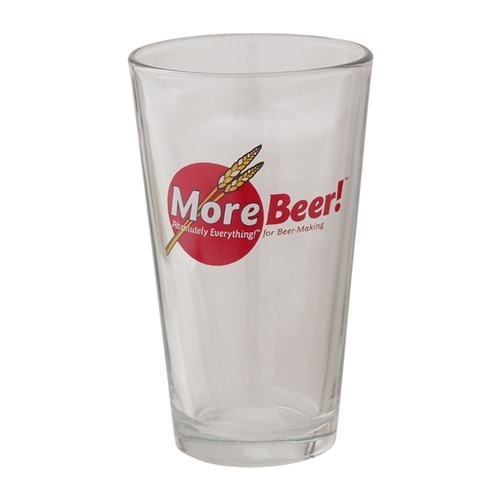 Pint Glass - 16 oz. The standard, good ol' pint glass with a MoreBeer! Logo. Nearly indestructible with that solid in hand feel. Also called a "shaker" pint glass. Why not have a beer glass? to raise the price for frfee shipping. Great glasses for the price. Added to my cart to reach the magical $59 mark, and I get to brag that I make beer. Wow....the holy grail of all brew delivery vessels! While unassuming and uncharacteristically drab, this glass packs a powerful punch the instant it hits your lips. Cool, refreshing and delicious*...well worth every penny! *actual result may vary, depending on the tasty golden beverage delivered to the lips within the clear, unblemished glass walls of this immaculate challis.